Best Stainless supplies high quality Nitronic™ 50 high strength stainless steel. Nitronic™ 50 stainless steel is an austenitic grade providing corrosion resistance greater than other typical austenitic grades such as SS 316/316L and 317/317L. It is also capable of nearly double the yield strength of similar austenitic grades. Nitronic™ 50 (XM-19) stainless steel offers yield strength three times that of 316. 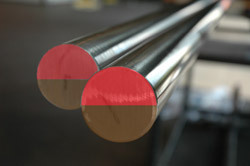 Our inventory of stock shapes includes Nitronic 50 round bar and pump shaft quality bar.